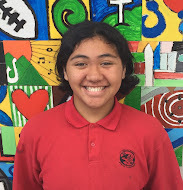 My name is Kyra and I am a year 7 from Grey Main School. I liked how you showed your working out in your maths book instead of just straight on the presentation. We also did work on fractions at one stage, I am not the best! Some of the word problems on there were about food, so that reminds me of food. And when I think of food I get hungry! Maybe next time you could make the text a little bigger and add a little color to the backgrounds!